Coronas - i . The head organization responsible for the preparation and coordination of the project is the Pushkov Institute of Terrestrial Magnetism, Ionosphere and Radio Wave Propagation of the Russian Academy of Sciences - IZMIRAN, Troitsk (Moscow), Russia. CORONAS-I NSSDC / COSPAR ID: 1994-014A NORAD ID: 23019. It is the first satellite of the CORONAS group. It was launched from the Plesetsk Test Range (Russia) on the Sun-oriented satellite orbiting. CORONAS-I carries SCR (Solar Cosmic Rays) instrument package created in D.V. Skobeltsyn Institute of Nuclear Physics of the Moscow State University (SINP MSU). SCR consists of three instruments: MCR (Monitor of Cosmic Rays), SONG (Solar Neutron and Gamma-Quantum) and SCR-3 (Solar Cosmic Rays-3). SCR package onboard CORONAS-I measures energetic electrons of energy E>0.5 MeV and energetic protons from ~1 MeV to hundreds of MeV and the nuclei from He to O covering the energy range from units to tenths MeV/nucleon. The SCR combines some of the most sensitive energetic particle sensors (MCR, SONG) ever flown in space. The data is available from March 1994 to june 1994. The experimental data in the database is accompanied by geomagnetic coordinates (L, B, magnetic latitude and longitude). The geomagnetic field is calculated using the IGRF95 model. The main detector is a large scintillation crystal CsI(Tl) with diameter 20 cm and height 10 cm. The effective geometric factor for detecting of electrons with energy >55 MeV and protons with energy > 80 MeV is about 4000 cm2×sr. The detector is overloaded in the region of South Atlantic Anomaly and in the maximum of outer electron radiation belt where the fluxes of charged particles is extremely high. SCR-3 has standard semiconductor telescope consisting of four axial n-p detectors with increasing thickness: 25, 100, 2000 and 2000 mm. SCR-3 measured the elemental composition from He to O covering the energy range from 1.5 to 10 MeV/nucleon for He, and from 3.3 to 42 MeV/nucleon for O. The geometric factor of telescope is 0.2 cm2×sr. *For detectors with low view angle the addition data operation is needed including the calculation of detector's pitch-angle. This procedure is available till September 1994. 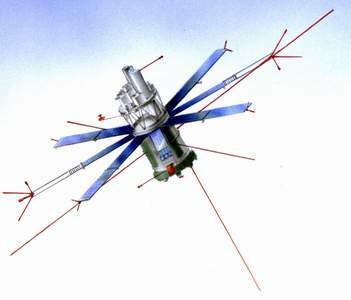 In October 1994 CORONAS-I satellite began to rotate and orientation of detectors was lost. ** Detectors with high sensitivity may be overloaded under the strong fluxes of charged particles especially in the regions of radiation belt maxima.